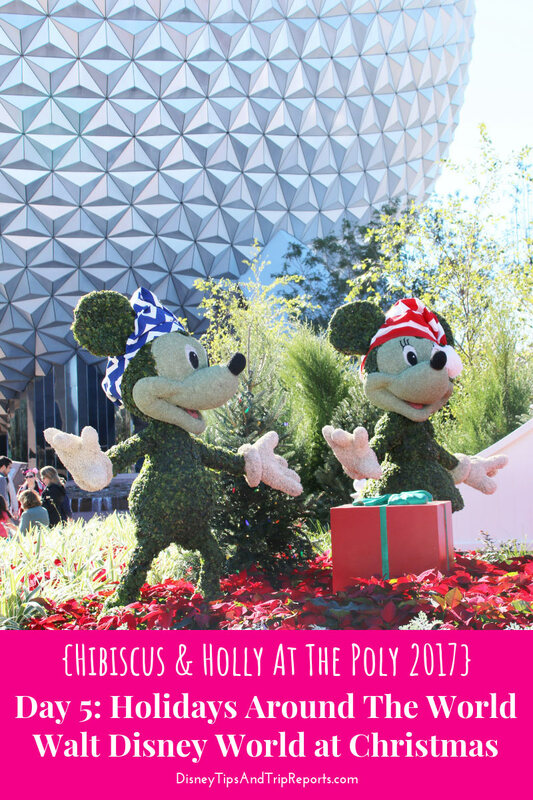 Day 5 of Hibiscus & Holly At The Poly 2017, the latest of my Disney Trip Reports, is here! Today we are at Epcot for the Epcot International Festival of The Holidays in World Showcase. We spend most of the day here before heading back to Disney’s Polynesian Village Resort to watch the Happily Every After fireworks from the beach. After doing security and scanning our Magic Bands at the [not there any more] turnstiles, we were finally in Epcot! We were beginning to really notice the crowd levels by now, and there was quite the line not only getting into the park, but also for Spaceship Earth. I’m sure since they added FastPass+ the line for this ride has gone crazy! But before getting as far as Spaceship Earth, we stopped to take some photos of the seasonal topiaries in front of it. There was a Disney Photographer taking pictures, but the line was long, so we didn’t bother to wait. I’m pretty sure Memory Maker is included with the park tickets (from the UK at least) these days, and I’m glad we didn’t pay out for it this year as we didn’t make use of the Disney Photographers this year. The topiaries were Mickey and Minnie, as well as Pluto. There was also Bambi, Thumper and Flower (photos of the latter two I got later in the day) and also Stitch. Before hitting up Epcot World Showcase and the Festival of The Holidays, we made our way into The Land for our FastPass+ for Soarin’. We haven’t been on this ride since 2011 and our very first trip! I can’t believe it’s actually been that long! Since then it has changed to Soarin’ Around The World with a new film. The ride seats are still the same, you sit in three rows and are elevated up to simulate being in a hang glider, soaring (see what they did?) over locations, landscapes, and landmarks across six continents of the world. Plus-Size Rider Guide: I took a photo of the ride seats so you can see them below. I would estimate that they are about 18″ wide. When sitting down, pull the seat belt all the way out and if you can’t reach round to clip it in place, ask a member of your party to help. Or if you’re flying solo, a Cast Member will be happy to help you. The loop in the centre of the seat is optional – mainly for children to prevent them from slipping. Bearing in mind I was a solid UK size 34 (US size 32) on this trip, and just about managed. The Cast Member that helped fasten my seat belt in, really yanked it round and into the clip. I would say at my size back then is about the max for fitting on this ride. I carry all of my weight around my middle, making the seat belt the trickiest part of it. The ride is about 5 minutes long so any discomfort felt is only for a short time. Ultimately if you are smaller than size me at the time of riding this, you’ll be fine with fitting! Oh, and those baskets underneath are for your loose items – if you have slip-on shoes like flip-flops you might want to take them off! It was a pretty awesome ride, but just as we were approaching the finale over Epcot, the ride stopped abruptly, the lights came on, and we were brought back down to the ground. No word that there was a malfunction and everyone just kinda sat there waiting for an announcement. Nothing came, so people just unclipped their seat belts and left the ride area. Steve did ask a Cast Member if there had been a problem with the ride. Apparently yes there had been, and he promptly gave us some FastPass tickets which Liam used later for Test Track. We then made our way over to World Showcase where you’ll find the Epcot Christmas tree just before the entrance. Along the way we saw some more topiaries – Goofy and Donald Duck, and a snowman too. There was also a stage set up by the fountains – not sure what that was for, but it had some colourful Christmas trees on it! I also bought myself a bottle of Cranberry Sprite… it was not very nice – bleh! We also saw a Hidden Mickey (I am not sure where, I thought it was by the Monorail Station, but it doesn’t make sense for it to be there due to where it was in my camera roll) and I’m also popping in a wreath from outside the Mouse Gear store as we must have passed that along the way too! The fact that the wreaths and decor in and around Mouse Gear have three gears laid out as Mickey makes me smile. Are they classed as seasonal Hidden Mickeys?! Okay, back to the Epcot Christmas Tree which was of course huge, (I wonder which is the biggest of all the Disney Park trees?) and very simply (I think) decorated with gold tinsel garlands, bells, colourful baubles, globes, and ornaments with different country flags on them. There were also pennants with holiday wishes in different languages nestled amongst the other decorations too. Sitting atop the tree was an angel holding the world above her head. A very fitting tree for this Disney Park I think.